Argentina’s flag has horizontal stripes of light blue and white with a gold sun emblem at its center. When the flag first came into existence in 1812, it did not feature the emblem. 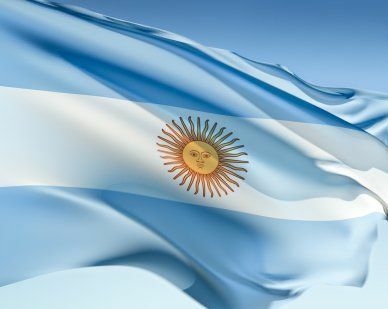 This flag is called the Ornamental Flag, while the flag featuring the sun emblem is the Official Flag of Argentina, Official Ceremonial Flag. There are conflicting stories about the symbolism of the flag’s colors. Some say the blue represents the Rio de la Plata, and the white symbolizes silver. Our top-quality Argentina flags conform to all official specifications. Emblems and designs are executed with the highest possible degree of accuracy in regard to detail, color shades, placement and proportion to flag size.